The first signs of spring are finally here. So it’s time to leave our warm cosy nest, and get out and about across Dumfries and Galloway, in one of our classic vehicles. We can’t be the only ones to feel that winter has gone on forever! 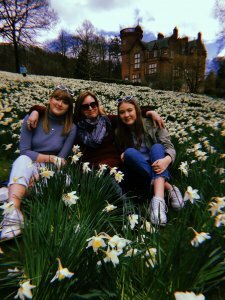 So here are a few of our favourite things to do, on a beautiful spring day. “A visit to an ornamental garden”. 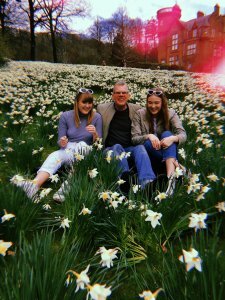 Our first trip out this year was to Threave Gardens and Estate, just outside of Castle Douglas. Lovely at any time of year, but in April the fields of daffs are a spectacular sight. All the little signs of life bring hope that warmer days are on the way! Other beautiful gardens to visit are Logan Botanic Garden , near the Mull of Galloway and Broughton House Garden, in Kirkcudbright. “A cliff top walk” Dumfries and Galloway boasts some of the most beautiful coastline in the country. Dramatic enough to rival Cornwall, but without the crowds! We love the cliff top walk from Balcary Bay to Rascarrel beach, near Auchencairn. The views are spectacular, with plenty of coastal birds to be spotted. And if you are very lucky, you may see a group of porpoises wallowing in the sea. The cliff tops in spring are particularly beautiful, with their “gardens” of thrift and spring squills. A wildlife lover’s dream. 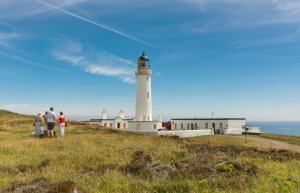 Why not try the Mull of Galloway, Scotland’s most southerly poiint, and striking lighthouse? 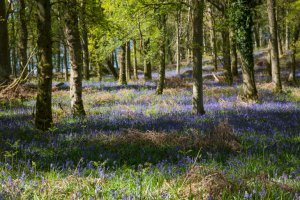 “A walk in a bluebell filled woodland” There is something magical about walking through a wood blanketed with colourful bluebells. And Carstrarmon Wood, near Gatehouse-of-Fleet, is one of our favourites. Peaceful and enchanting, a wonderful way to wile away a few hours on a sunny day in May. And maybe even spot the odd roe deer or red squirrel. You could also visit Aldouran Glen, near Stranraer. With its bubbling creek, waterfalls and iron age hill fort. It’s definitely on our list! “A tour of the artists and crafters of Dumfries and Galloway” End of May also brings D&G’s famous Spring Fling – an open studio event. This is a fantastic excuse not only to peak behind the scenes of local studios, but to drive around and explore the region at the same time. Take a look at our blog post here for a more in depth view of Spring Fling. “A stroll along a beach (and a bite! )” What is more relaxing and good for the soul than a walk along the beach? And D&G has a wealth of stunning beaches right around its long coastline. Then, after working up a good appetite, why not stop at one of the excellent pubs and cafes to be found?! Here’s just a few of our favourite beaches – Rockcliffe, Sandyhills and Powilliment, in between Dumfries and Dalbeattie. Carrick shore near Borgue. Killantringan near Portpatrick. Port Logan Beach. With a bit of luck, we will manage to find time to fit all these trips, at least once! 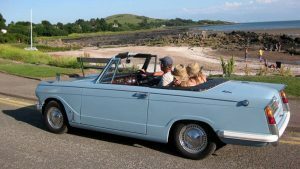 If you would like to hire a classic car or VW camper to explore Dumfries and Galloway this spring or summer, contact us here.